Students perform experiments to model the structure and function of watersheds. Students look at the effects of water velocity on discharge, sedimentation, turbidity, and dissolved oxygen content in watersheds. They also explore the effects of salinity and water temperature on the dissolved oxygen content of water. Students are introduced to two new pieces of equipment – oxygen meter and spectrophotometer in the course of this CELL. Through experimentation with models and data collection, students will explore questions such as: How do the abiotic factors of water velocity and discharge affect a watershed? How do the abiotic factors of water velocity, sedimentation, and turbidity affect a watershed? How does water velocity affect sedimentation and turbidity in a watershed? and How do the abiotic factors of temperature, water velocity, salinity, and dissolved oxygen affect a watershed? Introduction to the concept of velocity. 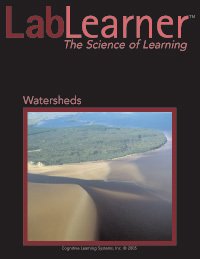 Study the effects of water velocity as it impacts the structure and function of watersheds. Learn that water velocity affects the discharge in a waterway. Study how water velocity affects sedimentation and turbidity in waterways. Investigate the effects of water temperature, salinity, and water velocity on the dissolved oxygen content of water. Demonstrate mastery of the concepts by relating the structure of a model waterway to the concepts of water velocity, discharge, dissolved oxygen content, and sedimentation.